Kitakyūshū (北九州, ) is a large city in Fukuoka prefecture on the island of Kyushu, Japan. Together with Shimonoseki it is part of the Kanmon Straits area. In terms of area it is the largest city in Kyushu, though Fukuoka has a larger population. The population of Kitakyushu is about one million (or 1.3 million including Shimonoseki). Kitakyushu was created in 1963 from the five smaller cities of Kokura (小倉), Moji (門司), Tobata (戸畑), Wakamatsu (若松) and Yahata (八幡), and it retains this sense of being a country area with much diversity and beautiful nature, despite its reputation as a steel town. Kokura, the heart of Kitakyushu, is an ancient feudal castle town guarding the Straits of Shimonoseki. Kokura was supposed to be the target of the second nuclear bomb in World War II. However, it was cloudy on the day of the attack and the plane diverted to Nagasaki instead. The modern city of Kitakyushu dates back only to 1963, when the cities of Moji, Kokura, Tobata, Yahata and Wakamatsu were merged by administrative fiat. The New Kitakyushu Airport (新北九州空港 Shin Kitakyūshū Kūkō) , built on reclaimed land offshore in Suo nada, the most westerly part of the Seto Inland Sea, opened its doors in March of 2006. With a size much larger than the airport it replaced, the New Kitakyushu Airport hoped to increase tourism and trade dramatically. The airport is served by several domestic airlines, including JAL and new discount carrier StarFlyer . Connections to Tokyo did indeed improve, but most other flights have petered out, with only service to Naha (Okinawa) and Seoul (South Korea)) clinging on. Hourly buses run between the airport and Kokura station (45 minutes, ¥600). Buses also run to/from Shimonoseki station eight times per day (70 minutes, ¥1000). If coming from the southeastern side of Kyushu, instead of going all the way to Kokura you can disembark at Kusami station (朽網駅), which has shuttle buses every 30 minutes or so to the airport, 20 minutes away. Kokura Station (小倉駅) is the main railway station and is on the San'yo Shinkansen Line. All San'yo Shinkansen trains stop at Kokura. Nozomi, Mizuho, Sakura and Hikari Rail Star trains make frequent runs to/from Hiroshima, Okayama and Osaka, with some Nozomi trains also running from Kyoto, Nagoya and Tokyo. Sakura trains also run to/from Kumamoto and Kagoshima. Both the San'yo Shinkansen Line and the Kagoshima Main Line (鹿児島本線 Kagoshima honsen) connect Kitakyushu to Hakata station in Fukuoka. On the Shinkansen, Kokura can be reached from Hakata in 15-20 minutes at a cost of ¥2050 for an unreserved seat. Frequent Kodama runs are made between the two stations during rush hours. Kokura ferry terminal connects with Matsuyama in Ehime Prefecture, Shikoku. The service is operated by Matsuyama Kokura Ferry Company. Shin Moji ferry terminal connects with Osaka, Kobe and Tokyo. The Tokyo service is operated by Ocean Tokyu Ferry, 03-5148-0109; passenger fares are ¥14,000 for second class and ¥26,600 for first class. Kitakyushu Monorail runs every ten minutes from JR Kyushu's Kokura station to Kikugaoka in Kokura Minami ward. Horse racing buffs can get off at the race course (Kokura Keibajomae), though you should check the race days first. The voice will announce a few stops in English, including the stop for the Kitakyushu Media Dome and for the University of Kitakyushu. Nishitetsu Bus operates local services, and express buses from Kokura station to Fukuoka airport, Hakata and Tenjin. The express buses are 1,200 yen for a single ticket, returns and pair tickets are a little cheaper. The city has the reputation of being just an industrial area, but this is only true of part of the coastline. The city covers a very large area (much larger than Fukuoka, 486 square km as compared with 340), and there are many pleasant spots for sightseeing and recreation. 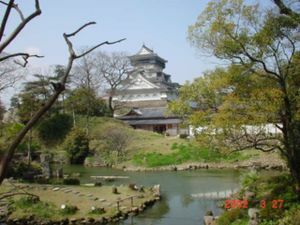 Kokura Castle (小倉城　Kokura-jō), a ten-minute walk from JR Kyushu's Kokura Station. Built by Hosokawa Tadaoki in 1602, it was the property of the Ogasawara clan which came from Harima (near Himeji) from 1632 to 1860. The castle was burnt down in 1865 in the war between the Kokura and Choshu clans. The keep was reconstructed in 1959, and the castle was fully restored in 1990. The Matsumoto Seicho museum and castle garden were opened in 1998. The keep contains a modern folkloric museum. Inside the castle you can see a video show about what Kokura was like during the Edo period, a display of Kokura Castle and its surroundings during the Edo period which is made of many lifelike tiny paper dolls, and you can also ride inside a palanquin like the castle lord would have when traveling. The box rocks back and forth to recreate the motion. It's amusing and free, so enjoy being the daimyo for a minute. You can also see two beautiful paintings of tigers with gold leaf on display. On one floor inside the castle there is a friendly older gentleman who is there to greet tourists. He makes scale models of Japan's castles out of toothpicks and his models are on display. If you can speak a little Japanese he is really kind and interesting to talk to. There is a gift shop on the lower floor (no ATM, bring your cash!) where you can buy souvenirs of the paintings inside the castle and (pay) telescopes on the top floor which allow interesting views of the cityscape. There are wheelchair lifts (pay) along the stairways affording access all the way to the top of the castle. Admission is charged to the keep (¥350), Japanese garden (¥300 yen) and Matsumoto Seicho museum (¥400). A joint ticket to the three attractions costs ¥700. Mori Ogai house in Kokura. Literary giant Ogai wrote his Kokura Nikki (Kokura Diary) here. Ogai was based at the castle at the turn of the 19th-20th century when it was a military base. He was born in Tsuwano in Shimane prefecture. The Toto Museum (TOTO ミュージアム) - free museum and exhibition hall of TOTO company, biggest toilet producer in Japan. The museum leads visitors through the history of Toto, beginning with the first ceramic flush toilet seat developed in 1914 and the company's formal establishment in 1917 as a pioneer player in the ceramic sanitation industry at a time when most of Japan was still without a sewerage system. Old toilet seats are on display, as well as exquisite porcelain tableware that the company used to produce as a side business in the past. Accessible by direct bus from Kokura Station, get out at Kifunemachi stop. Hiraodai (平尾台). A rare karst plateau in Kokura Minami ward, 30-40 minutes by car from Kokura station. The grassy mountains are covered with large gray round rocks which the locals will tell you look like sheep grazing. Great for walks, hiking and camping. Caves can also be visited and the Shonyudo cave is not to be missed - wade through ice cold water in midsummer. There is no direct public transportation to Hiraodai, but a reasonably priced taxi service is available. The taxi leaves from the Nakatani Nishitetsu bus terminal (中谷車庫) and stops five minutes later at the JR Ishiharamachi Station (石原町駅) on the Hita-Hikosan Line (日田彦山線). It leaves the bus terminal twice a day on weekdays (9.40 and 16.05) and four times a day on weekends and holidays (9.40, 10.45, 13.40, 14.50). For more information about the taxi, call Hiraodai Kankou taxi at 451-0201, or ask at Kokura station information desk on the third floor. Iwaya beach in Wakamatsu ward. You can catch the Kitakyushu City bus No. 41 from JR Kokura and Orio Stations. Get off at the last stop, Iwaya. Direct buses from Kokura station leave at 12.09 on weekdays and 10.16 on weekends and holidays. 440 yen. Beware jellyfish after mid-August! Mount Sarakura, accessible by Hobashira cable car, provides superb views of the city, especially at night. Kawachi reservoir in Yahata Higashi ward has an onsen (hot spring) with a rotenburo (outdoor bath). Courtesy bus from Yahata station. You can walk round the reservoir in about an hour, or rent a bicycle. Sugao no taki waterfall in Kokura Minami ward - cool and popular with Japanese residents in the summer. Watch out for baby wild boars (uribo) which have been known to nibble at feet in search of food (from personal experience). You can rent bicycles from Dobaru cycling terminal and cycle around the whole area for a few hundred yen. Buses run to here from Kokura Station. Kawachi Fuji Garden (河内藤園 kawachifujien), from JR Yahata Station, take a free shuttle bus to Ajisainoyu Onsen Bus Stop and continue walking for 15 minutes. Kawachi Fuji Garden has a lot of beautiful Wisteria tunnel for viewing. The entry fee is 200-1,000 Yen. The best time to view the Wisteria in full bloom is from late April until the middle of May. Since that time is also the Golden Week in Japan, prepare to see a lot of people if you plan on going there. Spend a day at Space World, Yahata Higashi-ku, . Near Space World station. A theme park created in 1990 by Nippon Steel when the company was downsizing its massive steel plant in the ward. This theme park offers a wide variety of enjoyable attractions for the whole family, a number of events held daily, and Space Camp, Japan’s first authentic educational space experience facility. Space Camp was created under a licensing agreement with the U.S. Space Camp Foundation, and provides a full curriculum, including special training using the same apparatus as NASA astronauts. The participants stay in the camp, and are given instruction by an expert staff. A variety of courses are available, catering to different age groups and length of course. Visit the Blast furnace near Space World. Japan's steel industry began here in 1901 and the original furnace is preserved as steelmaking was so important to Japan and the development of Kitakyushu in the 20th century. Also nearby are the city's natural history museum and environment museum. Cruise the Dokaiwan sea inlet between Tobata and Wakamatsu wards. This night cruising has just begun on an experimental basis in 2005. Advanced bookings required, 7-9pm, Fridays in August, leaving from Tobata ferry stage, about seven minutes walk from Tobata station. Four trips only this year. 3,000 yen per person. Includes visit to former Furukawa Kogyo building in Wakamatsu where we were treated to live Hawaiian music and beer. Overall a good evening. The boats used for the cruise are the ferry boats which ply between Tobata and Wakamatsu, Japan's shortest and cheapest ferry (3 minutes, 50 yen per person, 50 yen per bicycle). Walk to Honshu! Kanmon Pedestrian Tunnel starts in Moji-ko, near Mekari Park. The tunnel runs underwater between the islands of Kyushu and Honshu. After about ten minutes' walk you have emerged in Shimonoseki in Honshu, where you can ride a cable car up Hinoyama and enjoy a nice view of the Kanmon straits and Kitakyushu. Best on a clear day! ChaCha Town is a shopping/amusement center with a movie theater, game center, food court, clothing stores, a grocery store, and a very big 100 yen shop. Popular with families and younger teens. On weekends there are concerts and other attractions in the amphitheater- usually a kids' dance group, a magician, or a local musician. The shopping center's token large red ferris wheel isn't the biggest, but it's kind of a fun way to see the city at night. Take the 100 yen bus marked "Sunatsu/Chacha Town" from the bus platform underneath Kokura Station. Zenrin Map Museum in Riverwalk. The Zenrin company, whose head office is in the black segment of the Riverwalk complex, is a major local employer which pioneered mapping software in Japan. This location has been chosen because a famous Edo period mapmaker, Ino Tadataka, started making his map of Kyushu here. It is just 100 yen to enter the museum on the 14th floor, open 10.00-17.00 on weekdays, closed at weekends and on national holidays. The views of the city and Kanmon straits from the museum on a fine day are excellent. Kaikyo Dramaship in Moji-ko has a museum and a light show about the history of the Kanmon straits, good nautical souvenirs and regular live music events. Kitakyushu Manga Museum next to Kokura JR Station. The Museum is on a floor of AruAru City, a commercial complex mainly focusing on anime, manga, Japanese idol, etc. Tobata Gion  is designated an important intangible cultural asset of Japan and dates back to 1802. It involves the carrying of large floats called Yamagasa by about 100 men who shout "Yoitosa" to keep in time. Fourth weekend in July. Wasshoi Hyakuman Summer Festival  - August 6-7 in 2005. Many dance groups. Ends with a parade and firework display. Summer firework displays (hanabi taikai) are also held in various places in and around Kitakyushu in July and August. Usually at least 3,000 fireworks are let off. The biggest one with no less than 13,000 fireworks(!) is the Kanmon Straits display between Kitakyushu and Shimonoseki (August 13 in 2005). Be prepared for big crowds, especially on the trains to and from Kokura to Moji-ko. One of the best and most popular places for hanami is around Kokura castle, but there are many others. Stroll through Uomachi shopping area. The tiny traditional open-air Tanga market has fresh fish, fruit and vegetables in abundance. It is the oldest shopping arcade in Japan. Rihga Royal Hotel has several high-priced restaurants. There are many restaurants to suit all budgets in the Uomachi area near Kokura station, and at the top of the Isetan and Izutsuya department stores. Also try the sixth floor of Amu Plaza building above Kokura station. There is a McDonalds and a Lotteria Burger near Kokura station for more discerning palates. In the sixth floor of Amu Plaza building, there is a kaiten (revolving) sushi restaurant. The chefs will make sushi to request and oblige requests for substitutions or no wasabi. They also make some grilled/seared fish sushi -- delicious! They have a few vegetarian options like kappamaki and you can also get fresh fruit and fried chicken and other non-sushi dishes. Service can really vary from time to time though -- sometimes the waitresses are more helpful and sometimes they ignore you. For cheaper stuff or deli take-out, you can find lots of good things to eat in the basements of Isetan and Izutsuya. Towards the back of Kokura Station, across from the Shinkansen gate, there is a shopping area called Himawari Street. Downstairs in this area you will find another cluster of places to eat, including a sports yakitori bar, oden, okonomiyaki, yakisoba, Ringer Hut for fast food, and a 50's-60's retro-styled area of tonkotsu ramen places. Popular foods in Kitakyushu include karashi mentaiko (辛子明太子, spicy pickled cod roe), tonkotsu ramen (the stinkier the better, apparently), and yaki-udon (just like yakisoba but using udon noodles). Chanpon, yakiniku, and Korean food such as bibimbap also seem to be enjoying strong popularity. Kokura is, quite literally, synonymous with a type of finely filtered red bean jam known as ogura-an (小倉餡) with an alternative reading of kokura-an, which makes its way into all sorts of Japanese pastries and desserts. But in fact ogura-an is from Ogurayama, Sakyo-ku, Kyoto, and ogura-an pan (red bean jam in bread rolls) was first made in Tokyo. Xelha is a large bar near Kokura station, formerly run by a Scotsman called Colin who now owns Maroon. It is behind Isetan department store on the left side as you exit Kokura station. Food available. Open from 5pm most days. Xelha has a soccer team and a big screen for viewing sports. Address: Kyo-machi 3-6-23, Yoshin Bldg, 1F. Tel 093-551-8683. Booties Irish pub, Japanese-run, Guinness and pub food available. Smaller than Xelha. Opposite Izutsuya department store. Open from 5pm most days. Big screen for viewing sports. Round 5 is a very small bar in Konya-machi, Kokura run by a friendly long-term American resident named Bob. ¥100 karaoke. Open from about 8pm. Tel: 093-511-1002. There are three Starbucks in Kokura, one in Riverwalk, one near Kokura station and one inside the SunLive City shopping mall. Don Gaba Cho Restaurant and night bar on Furusemba-machi. Great atmosphere and always a laugh. Scintillating conversation and sophisticated pursuits guaranteed. There are all sorts of options from the lap of luxury down to the cheapest ryokan. Ask at the Information desk, third floor of Kokura station. Rihga Royal Hotel, 2-14-2 Asano (north of Kokura station), tel. +81-93-5311121, . The top hotel in town and the only Rihga Royal hotel in Kyushu. Shimonoseki on Honshu is a short train ride from Kokura. Additionally, StarFlyer has a promotion where, if arriving from or going to Tokyo on any of their flights, they will offer taxi service between Kitakyushu Airport and Shimonoseki for only 1000 yen. Hakata station in Fukuoka is twenty minutes by Shinkansen from Kokura, or about one hour by express. Beppu, the largest hot spring (onsen) area in Japan, is a little over an hour away. One or two night onsen package trips are very popular with the locals, and can be quite reasonably priced (often less than 10,000 yen per person). This page was last edited on 16 December 2018, at 17:55.